Emily and Brandon had an amazing engagement session! They had 2 parts to the shoot, incorporating some things special to both of their families.We started off the session in the Lockport NY area at the Palace Theatre and Lockport Locks. Brandon's father brought a vintage car that belonged to his father to use for photos.The couple was dressed for the red carpet! They looked stunning. It was perfect for photos with the car and for solos of the groom to be! The weathermen were calling for rain the whole day of the session. We had to reschedule once, but Brandon was attending school out of town, and this trip we had to go for it. After photographing with the vintage car, we headed about 2 hours from the area out to Emily's family cottage. 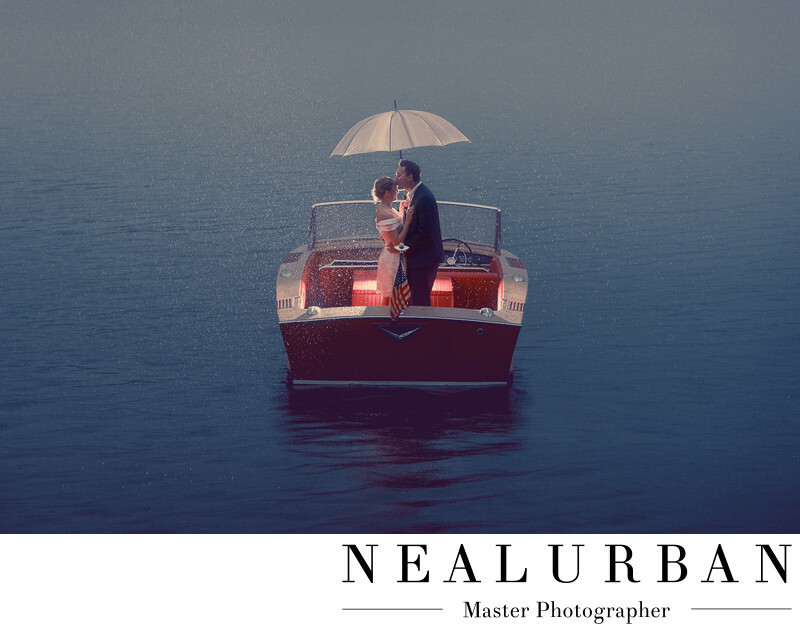 Her father was restoring a boat they wanted to used for photos. He literally finished it up and put it in the water a few hours before we arrived. It started to rain right when we got there too. The bride and groom were up for waiting it out for a little while. We saw a quick break in the weather. We would have about 20-30 minutes before a storm was to blow in. We had a game plan for the images and were ready to rock! There was a mysterious fog over the water. It created an eerie feel, which actually made some of the images look really dramatic. We started with father of the bride doing some drive bys with the hacker craft, while the couple was on land. It was so funny. He would float the boat and duck so he wasn't in the photos. Then we wanted to put the bride and groom to be on the boat. And now it was starting to sprinkle, so we knew we didn't have much time. Getting this image required all hands on deck! Dad picked up Emily and Brandon and we did some images without adding in any extra lighting. Now it was time to get artistic. A second boat, driven by the bride's sister was my transport. I had to get on the boat with the couple and hide behind them with a light. We did a person transport and light transport in the middle of the lake. Emily's sister was escorting me to the other boat and also helping to hand me the lighting once I was aboard. Meanwhile, Neal was documenting this whole series of events! It was ok if I fell in, but make sure the light gets on the boat! Once I got on the hacker craft, I hid myself with the light low and behind the couple. Dad was also ducking. We had the couple hold the umbrella, as it was raining even more now. I was giving them cues to kiss, separate, or go forehead to forehead, so Neal could get variety of images. Then we heard him yell,"We got it and it's a wrap!" It was now time to dry off a little and drive home the 2 hours and look at these amazing images! Emily and Brandon had a New Year's Eve wedding planned at one of our favorite venues, Rapid's Theatre. We could not wait for the wedding and were ready to create more amazing memories for this couple!